GardenGirltv | Mar 3, 2011 | Starting your own seeds indoors over the winter is a great way to save money, get stronger plants, earlier blooms, and a longer growing season. An affordable and sustainable way to do that is by starting your seeds in recycled toilet paper rolls! 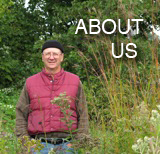 Learn more at gardengirltv.com and urbansustainableliving.com. AmericanNaturalFiber | March 3, 2011 | Sometimes I wonder if a lot of things we buy overseas are just the result of marketing and have no added benefit to us. The obvious costs are energy to transport from overseas, loss of American jobs in both agriculture and distribution and more … and possibly chemicals used in the materials or the methods to make them. We need to take a hard look back to a time in America’s past, to our forefathers and relearn a few things.